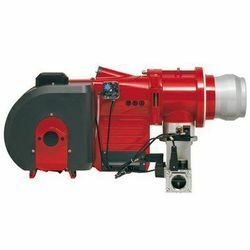 Our range of Air Monoblock Gas Burners is offered with an incorporated centrifugal blower which has suction damper for supplying combustion air. Also, a cylindrical blast tube of accurate dimensions is fixed on the discharge port of the blower. This blast tube carries assembly of gas pipe, ignition electrode and flame rod. Gas solenoid valve is installed at one end of the gas pipe where as its other end is blind and carries a specially perforated disc called "Diffuser Plate". Small holes are made along the periphery of the pipe to allow gas discharge, these holes are close to the plate but slightly on the inner side. The gas coming out from these holes comprehensively mixes with air discharged by the blower and the resultant mixture comes out uniformly through the diffuser plate. When air / gas proportion is correctly set, it can be ignited by a small spark. A Single Pole electronic ignition transformer of 100% duty cycle and ignition electrode, are used to produce this spark just in front of the diffuser plate. Another electrode, called the flame electrode, is placed through diffuser plate in such a manner that it makes contact with the flame to collect ions in it. Our Autocon burner controllers are used to monitor the safety inter locks such as Air Pressure Switch, switch blower, ignition transformer and gas solenoid valve. These products are available in various sizes starting from 50,000 k cal/hr to 5 lac k cal/hr. These can also be fabricated optionally with mono-block type gas solenoid valve which has two valves in series, mechanical and flow control valve. While the First valve is fast acting, the second valve is slow opening. We deal in Auto Ignited Gas Burners. 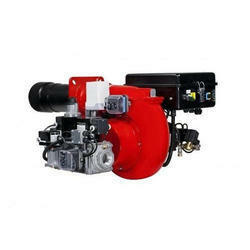 We also offer auto ignited and monitored pilot burner which is basically an iar aspirated small size burner. The burner operates at around 600 m bar gas pressure and produces a typical sleek pencil like flame. Our product has mounted ignition electrode and flame electrode which convert it into fully auto-ignited and monitored pilot burner. The main application of the product is in hydrogen furnaces for facilitating combustion of hydrogen at the inlet and the outlet of the conveyor based system. We offer Infrared Gas Burner. The medium wave infra rd burner is provided with perforated ceramic tile or braided wire mesh of special material which facilitates complete burning of the gas within the burner. Due to its unique design, there is no combustion below or above the tile or mesh. This also minimizes the production of flue gases as there is no excess of air. Infra red is known for its penetrative nature, it does not need air to heat an object. It effectively heats the object placed in front of it. This facilitates extremely low consumption of gas for the net output. Ceramic Burner - In this burner, combustion takes place within the perforated ceramic tile which after turning orange emits medium wave infra red radiations (2.4 micron). Its source temperature is 950 deg C and it develops thermal power up to 120 KW/esq. (max). The product finds applications in industries such as; Textile, Paint, Powder Coating and Process Heating.Metal Fiber Burner - In this burner, combustion takes place within the thin mesh of special steel which turns reddish orange and emits medium wave infra red radiations (2.2 micron). Its source temperature is 1050 deg C and it develops thermal power up to 200 KW/esq. (max). It finds applications in industries such as; Textile, Paint, Powder Coating, Process Heating, Paper Drying and Coil Coating. Porous Burner - In this burner, combustion takes place within the perforated tile which has two levels of perforations. While the lower region has medium size pores, the upper region has large size pores. Gas/Air mix enters the ower region where it gets pre heated and finally burns in the upper region. The heat removal from the combustion zone is mainly by radiation, conduction and convection. Also, this tile turns bright white at full power and gives out short wave infra red radiations (1.7 micron). Its source temperature is 1450 deg C and it develops thermal power up to 1000 KW/esq.(max). It finds applications in industries such as; Paper drying, Paint, Powder Coating, Process Heating and Coil Coating. Looking for Gas Burners ?